On the heels of our Bitcoin post from a few days ago, here is another post dealing with pricing decisions. As we discuss in the Setting Price: Part 1 and the Setting Price: Part 2 tutorials, marketers often consider many different options when arriving at a final price. One set of options falls under the category of psychological pricing, where marketers take into consideration how customers mentally perceive a product’s price. 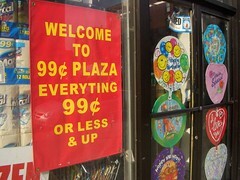 One of these psychological pricing methods is the so-called “odd-even” pricing method, where marketers may intentionally set price at a level where customers may perceive the product as offering a better value compared to a competitor’s product that is set slightly higher but at an even number price. For instance, setting the price at $5.95, compared to a competitor’s product that sells for $6.00. Marketers have been taught for years customers not only see a price difference between these two products, mentally some may believe it to be a sizeable difference. But marketers may want to take another look at this. According to this story, the effect of odd priced items may be less effective than in the past. This is based on academic research focusing on the evolving “pay-what-you-want” pricing model, where marketers allow customers to determine the price. As the story discusses, the majority of customers who make purchases where they determine the price prefer to set a price that is a round number, such at $20 instead of $19.95. The story offers several examples of purchasing situations where this is the case. To be realistic, the “pay-what-you-want” pricing model is far from being widely used. So whether the results reported in this story can truly apply to other types of purchase situations remains to be seen. In the mean time, the data presented is intriguing.